Competition in these markets is high, and was actually quite intimidating for me. Upon entering or approaching most booths, the staff will seemingly swarm around you, and watch your every move quietly, ready to answer questions, or make a sale. I prefer a bit more distance between me and the sales staff as I try to shop, particularly if I am just browsing for nothing in particular. 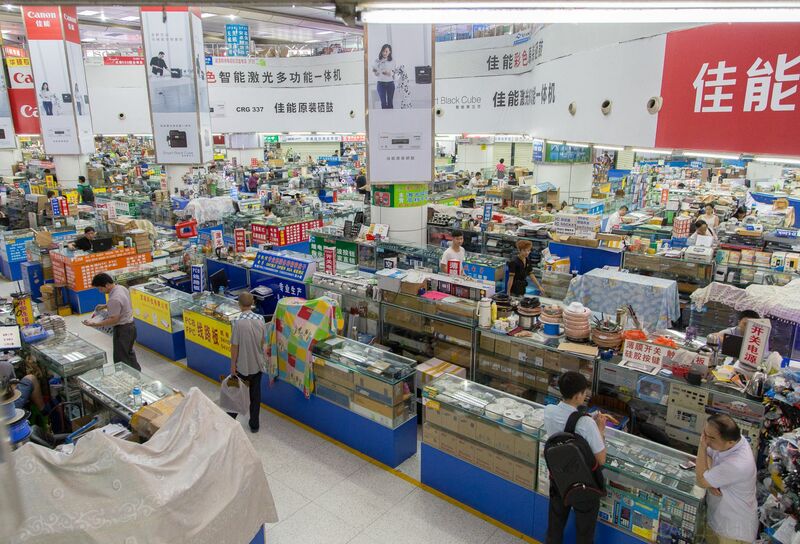 I spent most of my time browsing the SEG Electronics Market which is one of the largest in the district. The lower floors focus primarily on specialized electrical components. 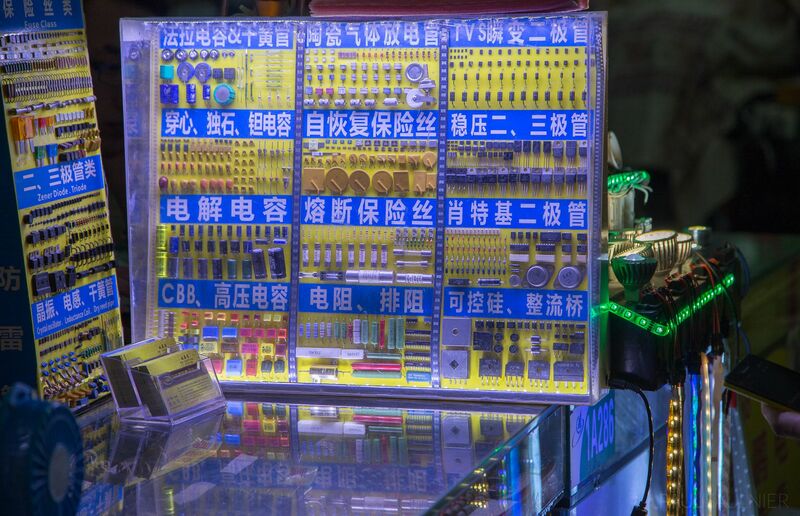 Some booths of the lower floors sell only one type of resistor, or motors, or LEDs, with no “finished” products for sale. I didn’t have an actual need for any of the electronics on display, but it is definitely interesting to see the selection. The upper floors focus more on consumer items, such as USB cables, keyboards, etc. In many cases, only the generic name of the product in English is written on the box, sometimes in Chinese as well. The company name is often omitted entirely! 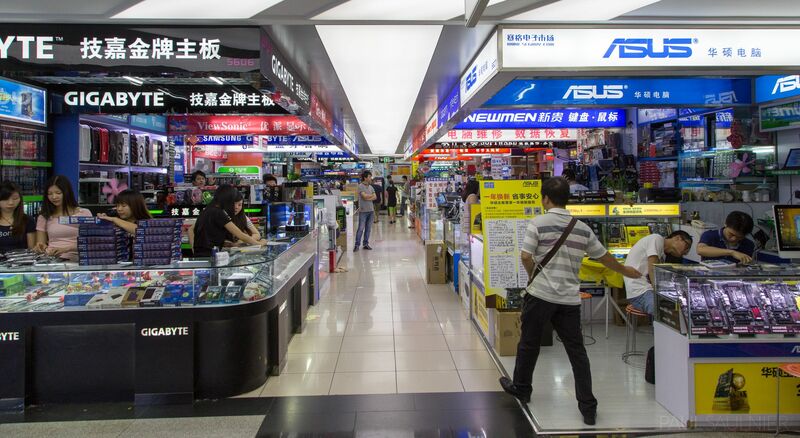 Many booths also specialize in providing several products from a specific well known brand, such as ASUS or Gigabyte, which are also widely available in the rest of the world outside China. 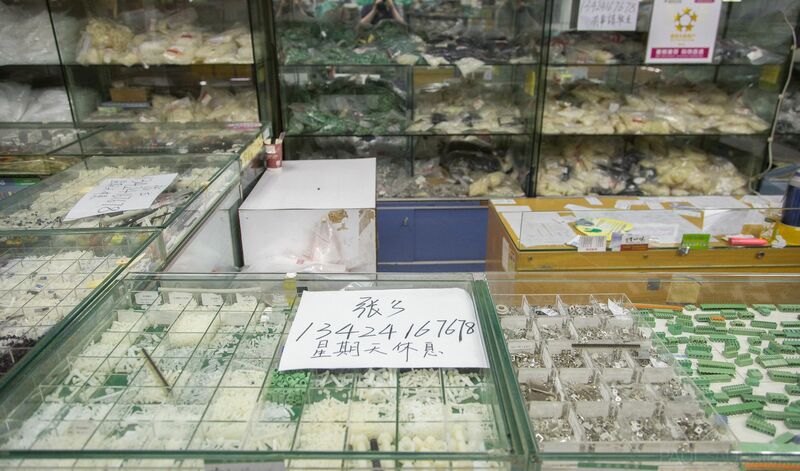 Outside the markets, hundreds of shops at street level are also selling consumer electronics. 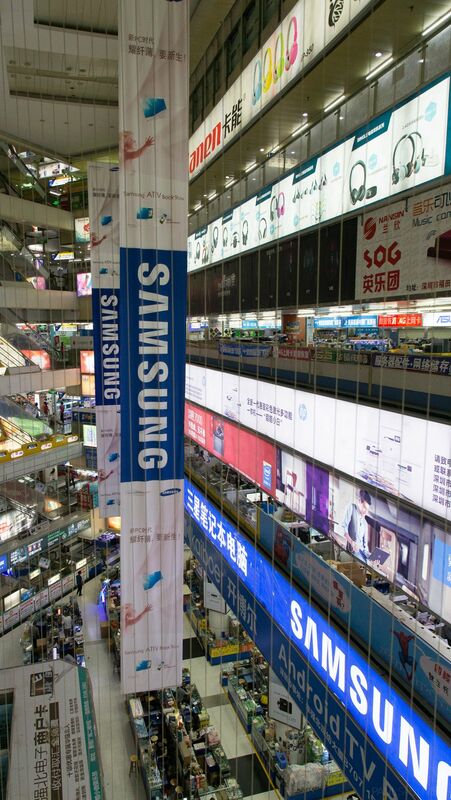 Apple and Samsung products are especially popular. 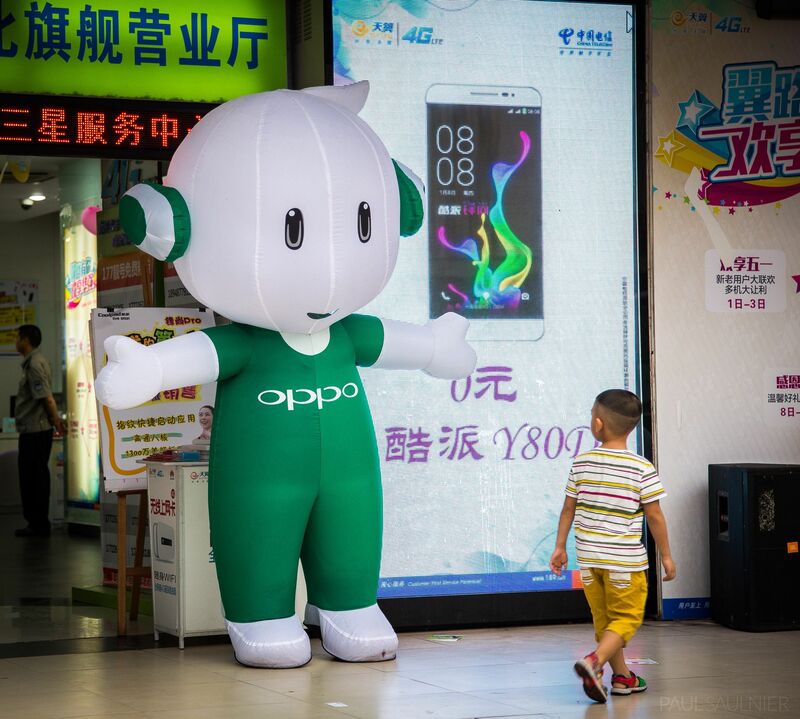 Shops will openly sell “copies” of popular devices, along with the genuine originals. 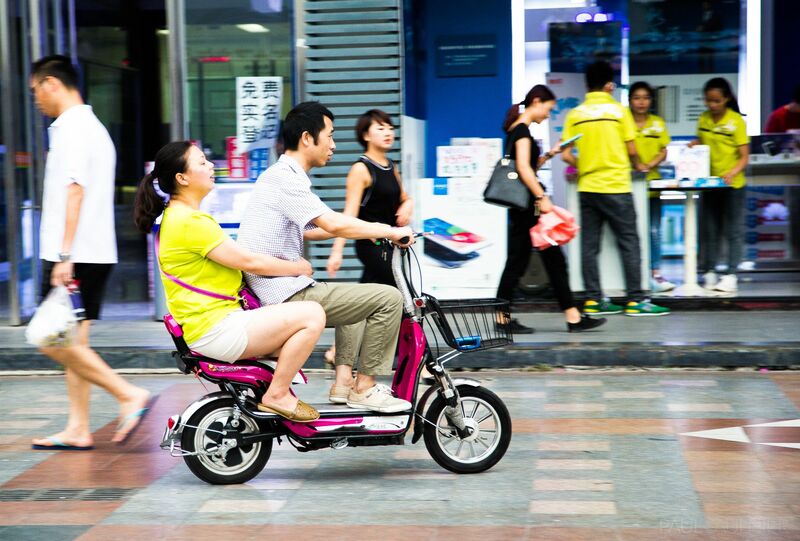 The extra wide sidewalks are ideal for all types of traffic, including motorbikes! The small street shop in the background has many motivated staff eager to sell mobile devices to you. Did you get a ride on the scooter 🙂 ? Also what were the prices like in comparison to NA? I didn’t ride any scooters sadly. Prices weren’t marked and I didn’t ask most of the time. In general though, unbranded items will be very cheap but name brand genuine products will be similar in price.